Every two weeks Avon has a new brochure with great deals on all your favorite products. But they also have their Outlet Book with fantastic sales that comes out every two weeks as well. This awesome little Book is “While Supplies Last” and has some of the best clearance prices around, but grab them quick before they are gone! With everything from makeup to bath & Body or home décor or mark This brochure is sure to be a treasure trove of goodies for you. So if you missed something in the regular book or if you are just a bargain hunter, be sure to check out the Avon Outlet Book. Want to make the deal even better? Become an Avon Representative and get your discount on top of the great deals! In addition to building a lucrative business to make money and live your dreams, you get your discount on top of the great sales so you can keep up your stock on all your favorite Avon Products. Let me help you build your business and sign up to sell Avon Now. 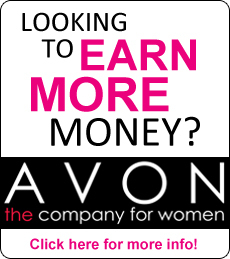 Click here to sign up to sell Avon and Begin to Build Your Business and Make Your Dreams Come True!